The MFC-7860DW offers everything you need in a monochrome laser all-in-one for your small business or home office. It offers high-quality printing and also can be used to make a quick copy or send/receive faxes without using a computer. Scan multiple pages using the 35-page capacity auto document feeder or use the document glass for scanning a single document. Its advanced capabilities allow you to scan documents to a file, image, OCR, E-mail, FTP site or E-mail Server. 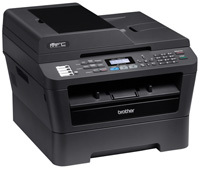 Plus, its built-in wireless 802.11b/g and Ethernet network interfaces allow you to easily share the MFC-7860DW, and its duplex printing capability enables you to produce professional-looking two-sided output. Flexible connectivity. Built-in wireless 802.11b/g and Ethernet network interfaces for sharing with multiple users on your network or connect locally to a single computer via its USB interface. Easily produce two-sided output. Print professional-looking two-sided documents and booklets using the automatic duplex printing feature. Also, create two-sided output from one-sided originals when copying and faxing. This feature helps to reduce paper use and saves money. Convenient paper handling. The MFC-7860DW can meet all of your printing needs via an adjustable, 250-sheet capacity paper tray that easily handles letter or legal size paper and a manual feed slot for printing envelopes and letterhead. Brother iPrint&Scan. Free app download for wireless printing (JPEG images) from and scanning to your Android smartphone.